Norderstedt, 6 juni 2018 - Cory Henry bracht een bezoek aan de Musikmesse om de nieuwe CT-X-keyboardserie van CASIO te presenteren. Nu volg deel twee van deze succesvolle samenwerking. CASIO lanceert vandaag een nieuwe muziekvideo met Cory Henry en het nieuwe CT-X5000-keyboard. De video is opgenomen in Frankfurt am Main in een 16 meter lange 'lichtcocon' in de vorm van een zeppelin. Deze stond op de grasrand van Niebelungenallee in de Frankfurtse wijk Nordend tijdens de 'Luminale 2006'. Cory Henry creëerde de track die nu wordt gelanceerd, vóór de opnames begonnen en, zo zegt hij zelf, hij had veel plezier met de nieuwe CT-X5000: "Ik heb me ontzettend goed vermaakt tijdens het opnemen van de track voor de video. Echt, ik heb thuis uren zitten jammen." Het bedrijf CASIO COMPUTER CO., LTD is een van de toonaangevende producenten van elektronische consumentengoederen. Het bedrijf werd in 1957 opgericht en streeft er sindsdien continu naar te voldoen aan het bedrijfsmotto, 'creativiteit en contributie'. Vandaag de dag maakt Casio horloges, digitale camera's, elektronische agenda's, calculators, muziekinstrumenten, projectoren, mobiele telefoonterminals, kassasystemen en meer. Norderstedt, 9 April 2018 For the official launch of its new CT-X keyboard series on the European market, CASIO welcomes a very special guest at the Frankfurt Musikmesse: On the 11th of April 2018 at 2 pm, the US-American keyboarder and pianist Cory Henry will present the CT-X top model to the public at the CASIO booth (Hall 11.0/ E90). The new CT-X series comprises four models – the CT-X5000, the CT-X3000, the CT-X800 and the CT-X700. All models boast the AiX* Sound Source: The new sound source reproduces the characteristic sound of acoustic instruments such as pianos, strings, wind instruments and drums and is exceptionally capable. The impressively powerful sound of the brand new audio-system of CT-X5000 and CT-X3000 tells its own tale. The CT-X700 (RRP 249.00 €) has been available since the middle of February 2018, the CT-X800 (RRP 299.00 €) has been available since the middle of March 2018 in specialist shops. The CT-X300 (RRP 349.00 €) and the CT-X5000 (RRP 449.00 €) will follow at the end of April. In addition to the CT-X series, trade fair visitors can look forward to more news: The CELVIANO AP-470 digital piano and the PRIVIA PX-870 in a new colour (brown) will also be presented to the European public. The CELVIANO AP-470 has 22 tones, including two new tones that reproduce the sound of two different grand pianos. Furthermore, the AP-470 provides both new haptics as well as a completely new design: The keyboard cover was redesigned and all controls were combined and are now located on the side panel. The AP-470 (RRP 1099.00 €) will be available at specialist shops at end of April, the model PX-870 (RRP 999.00 €) in brown starting immediately. Casio Computer Co., Ltd. is one of the world’s leading manufacturers of consumer electronics products and business equipment solutions. Since its establishment in 1957, Casio has strived to realize its corporate creed of “creativity and contribution” through the introduction of innovative and imaginative products. Today, Casio’s offerings include timepieces, digital cameras, electronic dictionaries, calculators, musical instruments, system equipment and others. 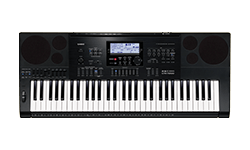 Norderstedt/ Anaheim, 25th January 2018 - CASIO is showcasing its extensive line-up of digital keyboards and pianos at Winter NAMM 2018, including its brand new CT-X series of portable keyboards and the CELVIANO AP-470 digital piano. Additionally, the PRIVIA PX-870 - which has been available since autumn of 2017 - can now also be found in brown. All four keyboard models from the CT-X line - CT-X5000, CT-X3000, CT-X800 and CT-X700 - boast the new AiX* Sound Source, leveraging expertise that CASIO accumulated in developing sound sources for digital pianos. The new sound source reproduces the characteristic sound of acoustic instruments and is eight times more powerful than comparable precursor models in similar price ranges. A special focus during development was the natural sound behaviour of acoustic instruments such as pianos, strings, wind instruments and drums. Furthermore the brand new audio-system of CT-X5000 and CT-X3000 creates an impressively powerful sound. More features of the new CT-X700 and CT-X800 are: 600 tones, 195 rhythms, synchro stop rhythm controller, tap tempo function und registration freeze button. Furthermore, the CT-X800 is equipped with a USB-to-device port and a pitch bend wheel. The models CT-X5000 and CT-X3000 have 800 tones, 235 rhythms and numerous features to realize own song ideas and arrangements such as a tone-editor, a pattern sequencer and a phrase recorder with four pads. The CT-X700 (RRP 249.00 €) will be available from the middle of February 2018 and the CT-X800 (RRP 299.00 €) will be available from the middle of March 2018 in specialist shops. The market entry and price of the two top models CT-X3000 and CT-X5000 have not yet been determined. The new AP-470 from the CELVIANO series provides both new haptics as well as a completely new design. Even the keyboard cover was redesigned, and all controls were combined and are now located on the side panel. 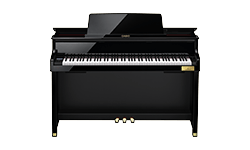 The AP-470 has 22 tones, including tones that reproduce the sound of two different grand pianos. Like its precursor model, the AP-470 has an openable lid. Other features are: Acoustic Simulator with damper resonance, string resonance, lid-simulator, key off and key action noise simulators. Furthermore, it is possible to control the piano via the free &qout;Chordana Play for Pianos&qout; app with a tablet or smartphone**. The whole package is rounded off with a volume-sync equalizer, headphone mode and an improved 40 W speaker system. The market entry in Europe and the price of the AP-470 will be announced at the earliest possible date. The model PX-870 (RRP 999.00 €), which was previously only available in black (BK) and white (WE), can now also be found in brown. Casio Computer Co., Ltd. is one of the world's leading manufacturers of consumer electronics products and business equipment solutions. Since its establishment in 1957, Casio has strived to realize its corporate creed of &qout;creativity and contribution&qout; through the introduction of innovative and imaginative products. Today, Casio's offerings include timepieces, digital cameras, electronic dictionaries, calculators, musical instruments, system equipment, and others.